Hindus prefer to wear red tilak and sandal wood tilak on foreheads. Also Lord Shiva wears Bhasma(Vibhuthi). Many of his followers do the same. How did this practice originate? One of the most visible external symbols of Hindu identity is the mark that many of us wear on our forehead. Origin of this practice is unclear. But, in ancient times, when the Varna system predominated, people used to apply tilaks differently that represented their Varna. Brahmins applied a white chandan mark signifying purity. Kshatriyas wore a red tilak that signified their valour. Vaishyas wore a yellow (usually turmeric) tilak which signified prosperity as they were traders. The Sudras applied a black tilak representing their service to all the above three Varnas. 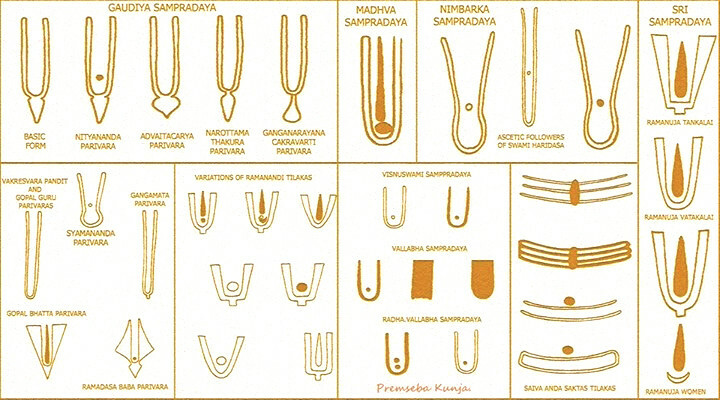 But later, the tilaks were used to denote which Sampradaya one belongs to. The worshippers of Lord Vishnu wore a tilak in the shape of 'U' (also called Naamam). The worshippers of Lord Shiva wore Bhasma/Vibhuthi in three horizontal lines (also called Tripundra). The lines and the color used may vary from region to region and from sect to sect. The area in which the mark is applied is between the eyebrows, called the Ajna Chakra. This is the point that most schools of Hinduism consider the entry and exit point of our jivaatma (soul). Scientifically, this Ajna Chakra area is often cited as the seat of thinking, concentration and memory. It is also the area which gets heated during stress and tension. Applying the tilak (generally using Chandan) has a cooling effect and aids concentration. In modern time, red tilak (Kumkum) is widely used by women. Considered a symbol of Goddess Parvati, it signifies female energy and is believed to protect women and their husbands. There is an interesting incident in the Ramayana regarding the significance of Kumkum. One day as Sri Jankidevi, wife of Lord Rama, was adorning her forehead with Sindur, Hanuman asked her, "Mata, why do you put this red thing on your head?" Sri Jankidevi replied, "By applying this, my swami (husband) will live long." Since Hanuman is a Parama-bhakta of Sri Rama, he thought that if a pinch of Sindur could make his master’s life long, a whole lot of it would make him live much longer. So he rubbed it all over his gigantic body! Well, even if the origin of the practice is unclear, the above incident in Ramayana makes it clear that the practice existed even during (or may be, well before) the Treta-yuga, in which Sri Rama lived. Tilak, a mark of Hindu Sanatan Dharma, comes from the Sanskrit word ‘til’ which means sesame seed. The sesame seed has great importance in yagnas and charity. A tilak is imprinted on a person’s forehead because it is the location through which one can channel Divinity, thus enhancing the spiritual character of an individual. Wearing Tilak (and/or Chandalo) has been a tradition of Hindu Sanatan Dharma. Every individual used to apply it on Forehead based on sect they follow. With time it has changed and now you see very few follow this practice. I still see followers of Swaminarayan, ISKCON, Varkari and few other sects do strictly apply tilak during their morning prayer. So as you can see trinity gods dwell within the marking of Tilak along with devotion can be the reason (which a normal Hindu rarely knows). Q: Gurudev, what is the significance of applying tilak on the forehead (referring to the portion of the forehead between the eyebrows)? What does it represent? Married women in our country also apply the tilak. What is the reason behind it? A: The third eye is present there (referring to the center associated with alertness or awareness). So there is a custom of applying sandal paste or other things at the location of pineal and pituitary glands which have a great effect on our body and mind. One reason for applying the paste is to give respect to that portion of the forehead. It stimulates our attention. Whenever you think, what do you do? Your hand automatically goes at this place. When you make a mistake, your hand goes at the head. When you think or deeply ponder over something or some problem comes then too you keep your hand like this. If you go to any country or any corner of the world, you find that everywhere people think like this. This is the seat of wisdom. It is the peetha (seat) of knowledge. That is why chandan (sandal paste), kumkum or sindoor (vermillion powder) is applied there. It is symbolic. Use of materials like turmeric, kumkuk (processed turmeric with lime), sandalwood, bhasma is not just symbolism, there is a specific purpose for them all. For eg turmeric has great value in "purification" of the body from neurotoxins like fluoride and activation of pineal gland. Hence they are applied before the beginning of the day or puja or any other kriya/spiritual process. Neurotoxins weaken the nervous system and calcifies Ajna Charkra. Ajna Chakra is the link of the person to the Divine. By getting body rid of these neurotoxins the Chakras get activated and nervous strengthened. This puts the seeker in a better shape to explore the consciousness and allow the divinity to enter in him/her. I have answered this in a different context at What is the significance behind saffron and turmeric mixed rice shower in hindu marriage? Shiva, vaishnava, shakthi, ganapathi, surya, skanda are the most popular gods of worship. Each of their ways of worship, rituals slightly differ and different types of tilaks symbolically represent the same. In my opinion, wearing tilak enhances the spiritual well being of the follower, noticing tilak on one's forehead head promotes dharmic feeling and fear of doing sin. tilak on starting point of womens' hair starting hair junction says she is married and her husband is alive. The Red Bindu is the red ocean of ananda - Bliss yes Bliss, it is a realization of unity of essence, all that is, is in essence the Bindu. It is only when the 5 chakras - the three lower gross chakras and the 2 subtle chakras above them have been transcended that enables Maha Kundalini Sakti to rise to the opened Ajna chakra and drink - yoke with Prakriti the essence of creative bliss. Today the Bindu is worn only as a symbol of this long forgotten realization. What is the significance of applying chandan on forehead? Why do Hindu women put Sindoor on her forehead? What is the significance behind saffron and turmeric mixed rice shower in hindu marriage? What do the various forehead dots and marks signify? Is applying sindoor compulsory after marriage? What Tilak or Namam does Lord Brahma have on His forehead? Didn't the Sati practice exist in India?